Fun though their collaborations are, it's somewhat depressing to note that Jerry Goldsmith's working relationship with Joe Dante is the only one that remains (although I guess you could count the Star Trek series). One would imagine that a composer of Goldsmith's calibre would have his Tim Burton, Alfred Hitchcock or Steven Spielberg to work with on a regular basis, but sadly not. After a somewhat fallow period, having directed only one film in a decade, Small Soldiers, Dante returns with what seems ideal for his talents; a film mixing the very animated Looney Tunes characters with live action. Unlike the Michael Jordan worship-fest of Space Jam, Back in Action has Bugs and co. playing off their original characters, rather than changing them for the benefit of a motion picture, but still leaving plenty of room for Dante's penchant for amusing pop culture and movie references. 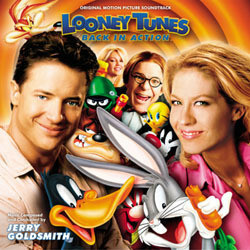 Looney Tunes is Goldsmith's most eclectic score in some time, with more random asides than any of his other Dante collaborations. Unfortunately, the one thing it really misses is a great main theme. The laid back, twanging guitar tune introduced in What's Up? is nice enough, but only when the Gremlins theme makes a cameo in Out of the Bag, is it obvious just how much more memorable it is in comparison. It was never really destined to be a score more than the sum of its parts, but the parts are mostly terrific fun. About the only consistent vibe is a spy sound, exemplified in the main theme, but many other styles cameo throughout, perhaps most memorably in the Mexican/Morricone guitar licks of The Bad Guys and Car Trouble. Immediately after, Thin Air turns into a sort of big band with electric guitars action romp (sounds like a headline from the News of the World) which is terrific fun, but soon interrupted by some screeching strings and amusingly eerie motifs for Area 52. Paris Street features some stereotypical accordions, before some surprisingly dramatic action in Free Fall. Indeed, some of action cues sound like they've escaped from a more serious score, which is something of a surprise. Due to last minute editing, the finale to the film was written by John Debney, which is why the album stops rather abruptly as none his work is contained on disc. It might be heresy, but this is the kind of film where I don't think the results would have been much less enjoyable had Debney (or David Newman or Marc Shaiman) written the entire thing, but Goldsmith's sound is still in evidence often enough. The start-stop nature of the score is a side effect of the film and in truth, it was inevitable that the music would be fairly schizophrenic. Don't let the rating fool you, this is terrific fun and for sheer pleasure, the most enjoyable score from Goldsmith in a few years. 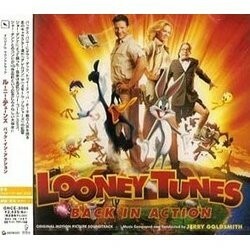 Jerry Goldsmith: Back in Action.